Camping trips with the whole family are wonderful for so many reasons. Adventures, cherished memories, the great outdoors—what’s not to love? The right camper trailer can make your trip even better. After all, you will all be living and sleeping in it for the duration of your trip. Choosing a camper that suits you and your family can be tricky. You have to find one that meets your family’s size, needs, and tastes. With so many options on the market, it can be hard to know where to begin. 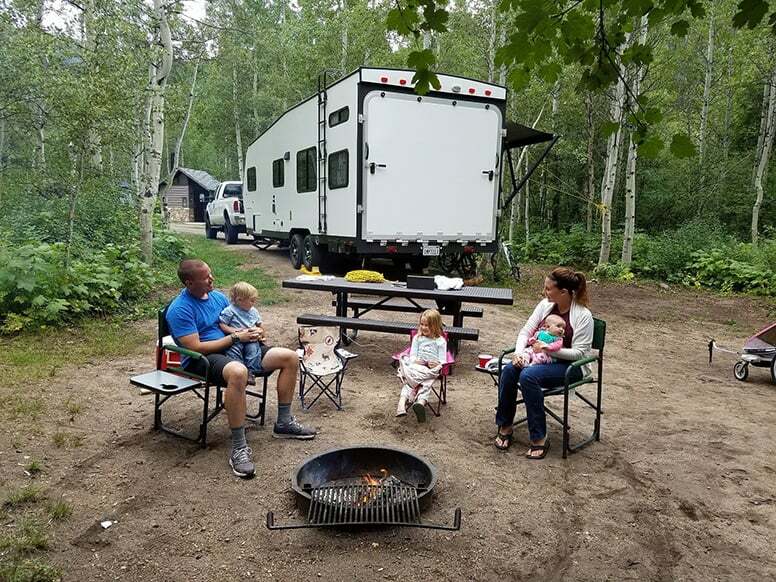 We are here to take the worry and headache away, and have compiled a list of nine of the best family camper trailers on the market. The Keystone Outback may be lightweight, but doesn’t skimp on the amenities. A range of features make it an ideal choice for mid-sized families. An eight foot refrigerator in the kitchen allows you to keep plenty of food in stock. As any parent knows, food can disappear quickly with kids around. A microwave is also included, for reheating meals and making snacks. There is ample storage space for everything you and your kids will bring along. This model has three external storage areas. Indoors, the pantry shelves are removable, so you can maximize storage space as you see fit. Parents who value privacy will appreciate the sleeping arrangements. Bunk beds are located at the front of the trailer and a king-size bed at the back. Most models will include a 32-inch HDTV in the living area. This is great for rainy days when you’re stuck inside, especially with little ones. Including this model, Keystone offers 15 floor plans, that sleep upwards of four people. Separate sleeping spaces for adults and kids. If you have more than two kids, one will be sleeping on the sofa near you. 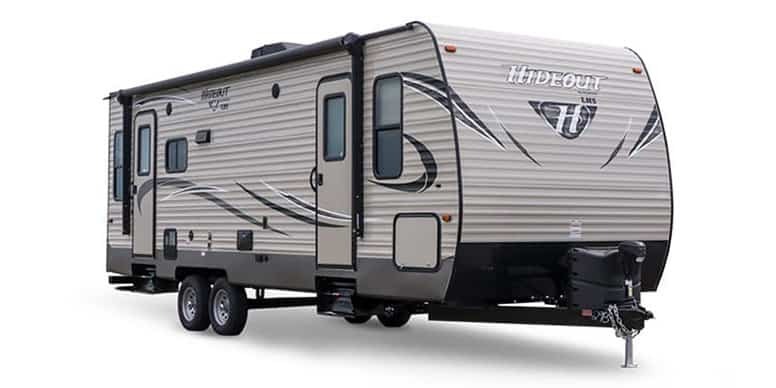 Keystone’s Hideout trailer is perfect for families who value entertainment. Whether it’s music, TV shows or movies, this model has you covered. The entertainment system includes internal and external features. A TV antenna with a booster on the roof will ensure you get the best signal possible. A cable hookup will enable you to keep up to date with the world while you are away. Smaller children can watch their favorite cartoons, just like at home. You and your older kids can follow all your favorite shows. The Bluetooth speaker system works for CDs, DVDs, and MP3s. Bring your best-loved tunes along for the trip. Older children will appreciate the chance to play their favorite music too. The exterior of this trailer has a cable and TV hookup, plus external speakers. You can spend evenings watching movies under the stars with your kids. 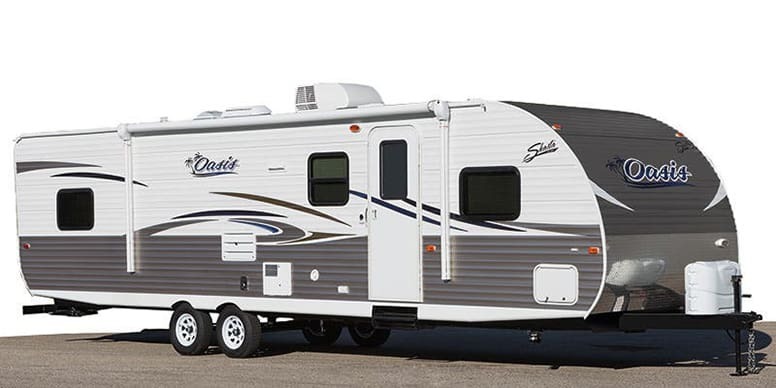 Note that you can choose between the standard and luxury travel trailer model. The luxury model comes with additional features, such as an HD LED TV. Choice between standard and luxury models for different features. Sleeping spaces at opposite ends of the trailer for privacy. If you want a true camping experience with your children, this is the trailer for you. The Cricket camper is built for boondocking with all the amenities. Unless you bring your own electronics along, there’s no entertainment system to distract from the outdoors. This trailer can be taken off-road and is equipped for trips off the grid. Your vehicle will serve as the battery for the electrical system. The windows are tempered tinted glass, to shield you and your little ones from the sunlight. 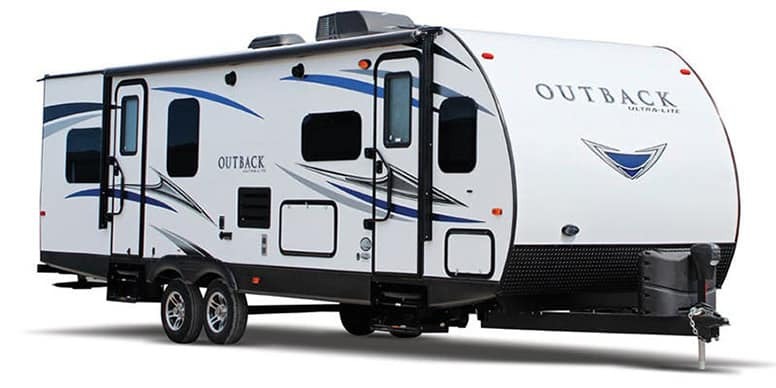 It’s also a good choice for families who are just trying out the RV lifestyle. The Cricket is compact enough to be stored in your garage when not in use. Even small vehicles (four cylinder engines) can tow the Cricket. The Cricket fits two adults and two children. Storage is ample for a standard camping trip, as long as you’re careful with the packing. Sleeping quarters are, admittedly, very close. The queen size bed can sleep two adults and two children. However, if you’re aiming to spend most of your time outdoors, this shouldn’t be an issue. Your kids will be thoroughly tired out by bedtime. Towable by almost any vehicle. Your children will outgrow the space. There’s a reason Keystone keeps cropping up on this list—they have a great range of trailers for families of all sizes. Those of you with big families, or kids who like to bring friends along, will appreciate the Keystone Passport 292BH. This trailer is built to comfortably sleep eight people. Mom and dad can sleep in the queen size bed at the front of the trailer. The kids can choose between two sets of double bunk beds, and a tri-fold sofa sleeper. You can make use of an outdoor kitchen for BBQs or extra cooking space. This is a useful addition when you’re preparing food for a lot of people. This model has two wardrobes in the front sleeping area and one at the back. There are three storage compartments on the trailer’s exterior. This is essential when you are traveling in big numbers, even if everyone packs light. The Passport series offers you the choice of 33 different floor plans. No front living area—at full capacity, things can get cramped. 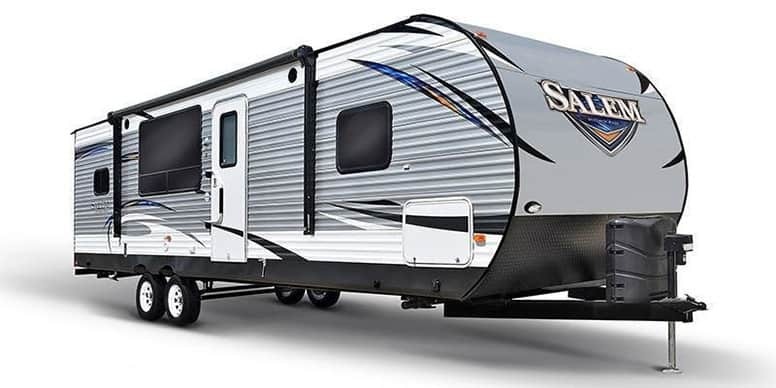 The Shasta Oasis 18BH travel trailer is a home away from home. 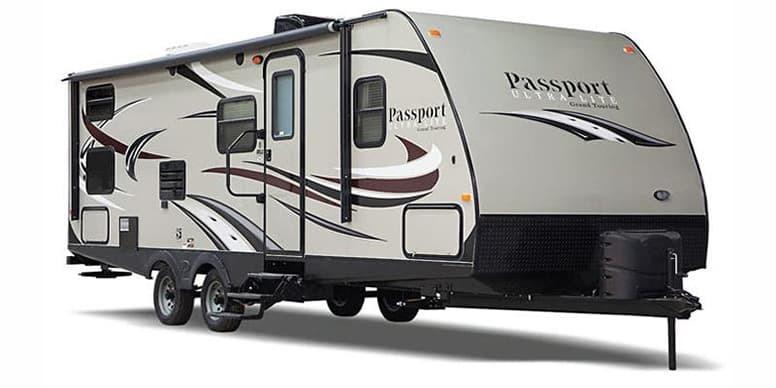 The way this model is designed, you might even forget you are in a trailer. This trailer fuses an outdoor camping experience with a stylish residential aesthetic. You can choose between two styles: chocolate or platinum. Storage compartments are discretely hidden throughout this trailer. You can keep everything from toys to camping gear underneath the bed, sofa, and dinette. You can take a break from the kids at the front of the trailer, in a queen sized bed. Your children will be at the other end in their bunk beds. Cooking meals for the whole family is simple with the fully-equipped kitchen. You can make use of a microwave oven and three-burner stovetop. Once the meal is done, clean-up will be made easier with a high-rise faucet. No more washing all those dishes and pots in a tiny sink. There are 10 other floorplans in the Oasis collection for you to choose from. With some models, you even have the option of an including a bathtub. Adequate room to live in, not just to sleep in. Floor plans to suit all sizes of family. The residential design is not for everyone. The Jay Sport 12UD trailer is a compact camper which has all the basics. This camper is durable and weather resistant. The tent material is mildew resistant as well as being water repellent. Like many other pop-up trailers, set up is made simple with a built-in lifter system. Since you’ll be traveling as a family, kids and adults of all ages will have some room to themselves. Two beds on either side of this pop-up camper give adults and children their own space. Built-in privacy curtains add an extra layer of seclusion. One of the two dinettes is multipurpose. The U-shaped dinette at the back of the trailer can serve as a sleeping space as well as an eating area. This little camper appears more spacious than it actually is. This is thanks to large windows and well-placed fold-out tent extensions. Although the camper does not have a bathroom, it does have a large storage cabinet for a porta-potty. If you’re willing to bring along your own, then you’ll be all set to go. There are four additional floorplans to choose from. Small—ideal for campsites with RV size limits. Can sleep up to eight. The purpose of a family camping trip is to spend time together. Still, if you are traveling with more than just a couple of kids, you might also need some time apart. Older children and teenagers will likely prefer their own area, away from the adults. Forest River’s Salem 31KQBTS delivers in terms of separated living spaces. Parents can enjoy their very own room at the front of the trailer. With a queen sized bed and entertainment center, you can relax in peace. This area also contains a wardrobe on each side and shelves above the bed. Pass-through storage compartments on the trailer’s exterior will save you space indoors. At the back of the trailer are two sets of bunk beds, separated by a generous amount of carpeted floor. There is also a second entertainment center, which is great for rainy days. An added benefit is that you won’t have to share yours. As with the front of the trailer, the back end also has two wardrobes. This means all your kids’ things will (hopefully) be confined to one area. The Salem line has 10 other floorplans available. Two distinctly separate living areas. Equipped with all the essentials. May be too large for some campsites and national parks. If you have a large family but don’t want a large trailer, consider an Airstream Flying Cloud 23CB Bunk. The model can sleep up to seven, but is fairly lightweight. Only 23 feet long, you won’t have any trouble taking the Flying Cloud 23CB to national parks. Most of them have an average limit of 27 feet. Despite its size, this camper is anything but cramped or dark. There are a total of sixteen windows and skylights to let in fresh air and light and give it an open feeling. The Flying Cloud has both a furnace and an air conditioning (AC) unit. The AC includes a heat pump for extra warmth in weather. The aluminium underbelly is also sealed and heated for extra protection against the cold. Furniture in this trailer is made from a material called Ultraleather. This is pet-friendly, durable, and resistant to scratches and stains. Those of you with younger children or pets can rest easy. The Flying Cloud line offers a choice of 18 other floorplans to choose from. You also have a choice of three color schemes: Sandpiper, Truffle, or Wild Honey. A decent amount of space, considering the trailer size. Furniture is not easy to damage, even with rambunctious kids or pets. At full capacity, quarters will be very cramped. If you and your family are looking to travel in comfort, consider the Dutchmen Aspen Trail 3100BHS. The only thing you will be sharing with the kids in this trailer is the bathroom—and family time. The entire rear end of the trailer is an enclosed bunkhouse, which has ample room for kids to play, as well as sleep. Not only will this delight younger children, but it is appealing for your teenagers too. They will have an entire separate living space away from mom and dad, including their own eating area. The bunkhouse includes a wardrobe as well as a dresser. It also has enough space to hold a TV set. Your kids will stay entertained when left to their own devices. Standard features of the Aspen Trail line include a cable TV hookup with an antenna booster. Two exterior speakers allow for outdoor entertainment. Rear bunkhouse for kids to have their own eating, entertainment and living space. Spacious living room for the whole family to enjoy. Outdoor kitchen for BBQs and additional cooking room. Large and heavy, not suitable for all national parks and campsites. Now you have a good idea of what type of family campers are on the market. I hope you’re closer to deciding which one will work for your family. Every family is unique: there’s no such thing as a one-size-fits-all family camper. Consider the future before you decide on a camper. As your children grow older, perhaps they will want to invite friends along. Maybe you’re planning to expand your family—you might need more space than you think. Do you have other models of family-friendly campers to recommend? Please tell us all about it in the comments. And don’t forget to share this article with other families looking for the perfect camper.